I tried this from a very old woman's era magazine. I have been preserving the torn sheet of paper for more than 30 years. Rasagulla, rasgolla or rasgulla, however we call it, is a melt-in- mouth sweet in sugar syrup, preferred by everyone. I celebrate my 400th post with these rasgullas as these are favourite of mine. Maida - 2 tsp. + 1 tsp. 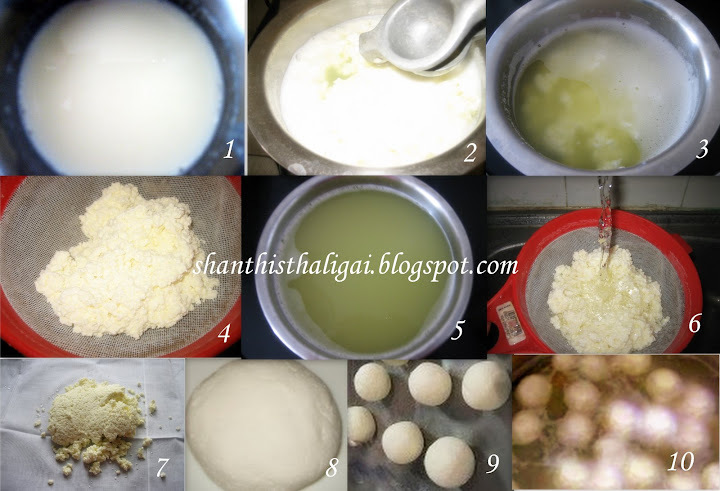 A detailed description of making paneer / chenna for rasgullas can be seen here. However, a quick description. Boil milk and curdle it with lime juice. When the whey separates from the milk, drain completely. (This whey can be stored in a bottle and refrigerated. It can be used for future curdling of milk for rasagullas). Drain completely till all the whey is dripped. Wash in running water, transfer it to a muslin cloth and tie with the twine. Twist and squeeze the cloth to remove the water completely. Allow it to hang for an hour. Now your chenna (crumbled paneer) is ready. Knead chenna alongwith 2 tsp. maida to a smooth dough. Knead well without any cracks on the surface. Divide the chenna into equal sized balls. I got about 28 - 30 chenna balls from 2 litres of milk. (The balls will double in size while cooking in the sugar syrup). Make a light solution of 1 tsp. maida and 1/2 cup of water. Combine sugar and 2 cups of water in a large vessel. Heat the solution till the sugar dissolves. When the syrup starts boiling, add in the milk and the dirt and impurities in the syrup will float on top. Simmer the stove and carefully remove the dirted layer with a ladle. Slowly pour the 1 cup of water THROUGH THE SIDES OF THE VESSEL and again remove the impurities if any. By doing this way, you are assured of a perfect clear sugar syrup. Heat the sugar syrup add little maida solution and gently add the chenna balls to the syrup. The sugar syrup becomes frothy while adding the maida solution. Sprinkle the maida solution on and off, when the froth subsides. Cook the rasgullas in sugar syrup for about 15 minutes partially covered with a lid. DO NOT COOK IT COVERED FULLY. HOW TO CHEK IF THE RASGULLAS ARE DONE? : Press the rasgullas with your index and forefinger. If its soft without losing its shape, then it is done. Transfer it to a container. When cool add the rose essence. Serve chilled. VARIATION: SAFFRON DISSOLVED IN A SPOON OF HOT WATER CAN BE ADDED FINALLY TO GET KESAR RASGOLLAS. THE COLOUR OF THE SYRUP AND RASAGULLAS CHANGES TO A LIGHT YELLOW COLOUR WHEN SAFFRON WATER IS ADDED. Rasagulla looks sooooo tempting and perfect.. amazing clicks !! WOW..congrats on crossing such a big milestones...the rasgullas are looking perfect to celebrate the occasion. 30 years later woven magic for a milestone post. Very yummilicious and befitting:) They look just perfect. Congratulations and wish you many more milestones to come by. Can I come to your home today dear...fabulous clicks..! Wow,Congratulations on your 400th post.Spongy and yummy rasgullas looks absolutely perfect. Hearty Congratulations on your reaching a milestone.400 posts is no mean achievement.Behind it there lies hard and sustained work for long time.Your blog has become an useful reference book for vegetarian cooking. When I look at the picture of rasagolla, it looks so real just as I saw them floating in the mud pots at the mishti dhukans in Kolkata.Your photographic skill matches the high quality of your posts.It is a visual delight to visit your blog. Perfect rasagollas, appreciate the illustrative clicks too,thanks for sharing. Congratulations on the milestone. You have been saving cutouts od recipes for last 30 years !! Wow commendable !! Rasgulla looks damn perfect...congrats for 400th post..
Congrats shanthi... rasgulla looks perfect and tempting. Rasgulla looks soo yum and perfect...and Congrats on the 400th post ! Congrats Shanthi!!!!!!!!!!!!! We wish you many more success.Nice way to celebrate.Will call you soon. Wow this is amazing...thanks for the minute details in cooking rasagullas this to make mine better..
Congrats Shanthi... The rasagulas are sooper..
Hearty congratulations on 400th post, amazing perseverance and adhering to quality. Congratulations on your 400th milestone and wising you many more to come akka! Rasgollas look perfectly yummy and luscious! Congrats Shanthi on 400th post. Amazing milestone. May you have many many more milestones like this. Mouth watering rosogullas. Please feel free to send it to my "Flavors of Bengal" event. Rasagulla is one of my all time favorite delicacies... i dont get to eat the home made one that often…Thanks for the recipe!!! Rasgulla looks perfect for the occasion..love this anytime..
Lovely rasgulla.. looks perfect dear.. thanks for the awesome recipe :)Congrats on 400th post dear!! Congrats congrats.. wish u many more milestones.. the rasagullas are just perfect.. looks sooo tempting. congrats on your milestone.lovely and yummy rasgulla. congrats Akka for the milestone. Wishing you many more hundreds on this blog. Congrats on ur 400th post, wat an excellent sweet to celebrate this great milestone,wishing u more and more like this..
Juicy rasgullas looks so tempting,nice preparation.Congrats on your 400th post. congrats and thanks for visiting me. glad to follow you.